Weekend hours for assistance with parking permit registration assistance. Click here for info! 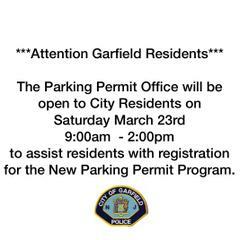 City Hall will be open Saturday March 23, 2019 from 9a-2p for assistance with registering for the new parking permit program. parking enforcement officials and police officers will be there to assist you with registering or answering any of your questions.